The literary journalist George Plimpton penned a hilarious and insightful series of popular books in which he donned the trappings of a “professional,” going through the motions of training with pro boxers and the Detroit Lions football team, trying out as an aerialist with the Beatty-Cole Brothers circus, and even winning a seat as a percussionist with the New York Philharmonic. Too bad that George never tried his hand at working in an architectural firm. Behind Plimpton’s posture of a curious outsider hobnobbing among the pros in various arenas was implicitly a respectful, but also sometimes irreverent overview of how “professionalism” gets defined. Plimpton’s books from the 1960s still work as lively reminders of an age when “Question Authority” widely penetrated the thinking of major contributors to American popular culture. It might be a stretch to call Robert Gutman (1926-2008), the distinguished academic who defined the sociology of the architectural profession, as the “George Plimpton” of architectural education, but I don’t believe that Gutman and his many illustrious former students would find the comparison inappropriate. Quite the contrary. 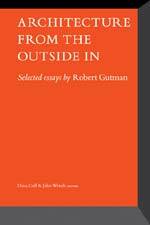 Gutman had no more formal architectural education when he began his research into the meanings of architectural professionalism than Plimpton did about the inner workings of a pro football team. They both knew how to ask the right questions to the right individuals at the right moment, positing queries only a brilliant outsider to a profession would think to ask. These essays, and former student-current architect responses, are absolutely relevant to most major ongoing issues among architectural educators and practitioners now. Yet how many architecture schools in 2010 continue to prepare students for primarily a design-centered practice? How many starchitects continue to design unlivable awkward spaces? Nevertheless, I’d like to think optimistically about Gutman’s gift to the profession in which he was never a direct practitioner. In an eloquent essay by former student (now Dean of the School of Architecture at Rice University) Sarah Whiting, Gutman is hailed as one of the few people who thoroughly understood the intellectual discipline of architecture, “...the players, the histories, the precedents, the stories, and most importantly, the resonances.” She imagines that she could invite her graduate students in architecture to a banquet where they would sit among the major architects of our time, and become nourished through conversations with them. That fantasy seems apt for a former Gutman student. He was a sociological genius who might have dined and conversed with the geniuses of architecture, if only in imagination, asking them, daily, questions about balancing beauty and the public good no one else would think to ask.